John, called “Paul” by his family (since his father’s name was John), “John” by those who first knew him upon his move to California, and later as “John Paul” (his first and middle name) by most who knew him. John Paul was born in Columbus, Nebraska, and grew up in the small farming town of Platte Center. Although he never stated his true birth year, it is believed to be either 1954 or 55. He attended St. Joseph grade school in that town, and graduated from Lakeview High School. While at Lakeview, he was a member of the Madrigal Singers, school choir and drama clubs, speech and debate teams, and Quill & Scroll International. He was a Boys State delegate, editor of the “Viking Viewpoint” and class valedictorian. Upon graduation, he attended the University of Nebraska in Lincoln, where he studied dentistry for two years before moving to West Hollywood, California in 1979. Despite the move, John remained a die-hard “Huskers” fan. John worked in the field of ticket sales and eventually became the Assistant Treasurer of the Ahmanson Theater in downtown Los Angeles where he worked with many people who became his closest friends, including Hugh and Jerry. John was a proud member of the International Alliance of Theatrical Stage Employee-Treasurer and Ticket Sellers Local 857. John’s passion included geography, drawing, cooking, collecting model replicas of classic cars and sending gifts back home to his mother, Alice. He was a member of the National Geographic Society, Horticultural Society and the Smithsonian Institute. ON weekends when he wasn’t at work, he could be found at the old La Brea Holiday Health Spa or the neighborhood bay “Rafters” with his close friend Paul, who also died from AIDS. John grew up in the Catholic Church, and had served as an acolyte, lector and religious education aide at St. Joseph Church. He was always a believer, and remained friends with Father Don Storz in Nebraska, as well as being a member of St. Ambrose Catholic Church in West Hollywood. John spent his last months at the Chris Brownlie Hospice by Dodger Stadium in Los Angeles, and his sister Rita, her husband Dave and his mom visited him there to say goodbye while his health still allowed. Memorials were held at the hospice for John’s Los Angeles’ family and in Columbus and Platte Center for those in Nebraska. Following the publication of his obituary, his family was contacted by three other families in the Columbus area who were coping with their sons dying from AIDS. 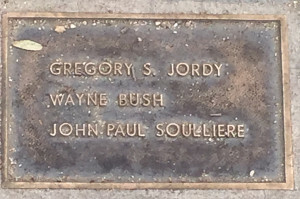 In addition to the Aid For AIDS/West Hollywood plaque in front of the “Cultured Cow” frozen yogurt shop at 8725 Santa Monica Boulevard, John’s sister hand-stitched a panel for the AIDS Memorial Quilt, depicting John and his hobbies, which was dedicated in 2001. I wish to leave my epitaph. Please lower slowly, to the ground. St. Patrick’s soil they’re rested in. No sadness long can linger here. 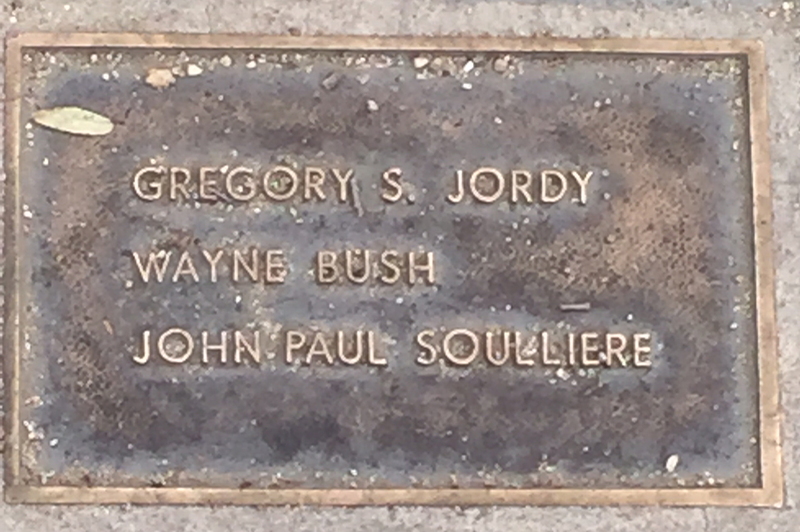 The plaque for John was purchased and dedicated in 1994 by Sgt. Mitchell Grobeson, the first openly gay officer in the Los Angeles Police Department, who cared for John when he became ill. Sgt. Grobeson is particularly grateful to Michael Haibach, the former Vice President of Aid For AIDS and a friend of John Paul, for his assistance in the plaque dedication.